2: The Lead undercuts his left foot with his right foot, taking weight on his right foot where his left foot used to be and passing his left foot to the side. The Follow undercuts her right foot with her left, taking weight on her left foot and passing her right foot to the side. * A popular alternative specifies a heel click on count 3, bringing the right heel to the meet the left heel in mid-air. Below, there are four sources for the lifted version, three sources for the heel click version, and two sources that are unclear. Gilbert 1890 describes both versions, calling the lifted version the Spanish Mazurka. 4: The Lead slides his left foot along LOD while the Follow slides her right foot along LOD. 5: The Lead undercuts his left foot with his right foot, taking weight on his right foot where his left foot used to be. The Follow undercuts her right foot with her left, taking weight on her left foot. 6: The Lead leaps clockwise around the Follow across LOD, turning 180° clockwise as he does so. The Follow leaps forward along LOD, turning 180° clockwise as she does so. Easily verbalized and remembered as "slide-cut-lift, slide-cut-leap." Gilbert 1890 notes that the turn can be made in either direction (right half turn on counts 6 and 12, or left half turn on counts 6 and 12), that the turns can be alternated for a zig zag pattern (right half turn on count 6, left half turn on count 12), or that the turns can be made "to the right and left at pleasure." In the first three counts, turn half round [sic - corrected in Hillgrove 1863] turn half round; in the second three, half round again, which completes the circle. The lady merely reverses the foot. This dance is a combination of the polka and mazourka. The position is the same as for the waltz or polka. 1. Slide the left foot forward to the left (count one). 2. Bring the right foot up to where the left foot is at the same time raising the left foot in front (count two). 3. Spring on the right foot and pass the left foot behind, without touching the floor with it (count three). 4. Then slide the left foot forward (count four). 5. Bring the right foot up to the left foot's place, and at the same time raise the left foot in front (count five). 6. Fall on the left foot, raising the right foot behind and turn half round (count six). Then recommence with the right foot, and so on—first commencing with one foot and then with the other, alternately. For the lady, the directions are the same, except that she is to reverse the feet. The Gentleman slides his left foot aside, he then brings up his right foot to the left to the first position, then taps the heels together while off the ground, without turning during these few movements; he then slides his left foot, after which he brings up his right foot with a slide, then springs on his left foot, at the same time turning half round with the right foot up behind; the same six movements repeated, beginning with the right foot. 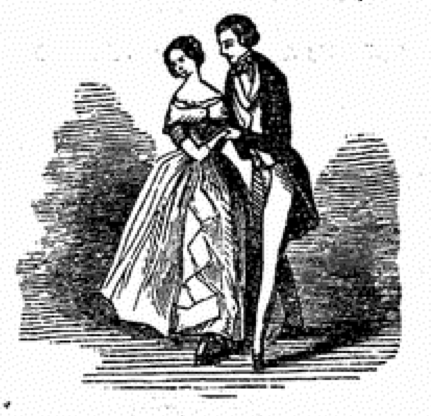 The Lady commences the dance by sliding her right foot to the right. The figures à la Polka. The step of this dance is, as its name implies, a mixture of the steps of the Polka and the Mazourka. It is a favourite dance with the Parisians, but has never been very popular in England, probably from the same reasons which prevented the success of the Cellarius. Yet is is a pretty dance, and the step is easily acquired. We recommend it to the attention of our readers. The time is 3/8, and quicker than that of the Cellarius. Gentleman takes his partner as in the valse. Figure en tournant. We describe the steps for the gentleman; the lady simply reverses the order of the feet, using left foot for right throughout. 1st beat.—Rest on the right foot, with left foot a little raised behind, and slide left foot to the left. 2nd beat.— Spring on the right foot, bringing it up to where left foot is, and raising the latter in front. 3rd beat.— Spring once more on right foot, passing left foot behind without touching the ground with it; this ends the first bar. 2nd bar, 1st beat.— Slide left foot to the left, as before. 2nd beat.— Spring on right foot, as before, and bring it up to the place of the left foot, raising latter at same moment. 3rd beat.— Fall on the left foot, and raise the right foot behind; end of second bar. Begin third bar with right foot, and continue as before. You turn half round in the first three beats [sic], and complete the circle in the second three. This is a combination of the Polka and Mazourka. Resting on the right foot, slide the left foot sideways to the left, (count one), bring the right foot up to the heel of the left at the same time passing left foot to second position, (count two), spring on the right foot and strike the heels together, (count three—one bar), then turn half round with the Polka step without hopping, recommence with right foot, which completes the turn. Slide left foot to 2d position (count one); draw right foot to 1st position (count two); hop on right foot, and at the same time bring the left heel against the right heel (count three). This completes the Mazourka step. Then turn half round with one polka step, beginning with the left foot, and count four, five, six. Repeat the same by commencing the Mazourka step with the right foot, and so on. Slide left foot to side (2d), 1; draw right to left, at the same time passing left to side (2d raised). 2; hop on right, at the same time striking heels together, 3; one measure. Polka one measure, ommitting the hop which precedes the slide. Repeat, commencing with the right foot. The Mazurka should be made in a direct line to the side, the turn being made on the Polka. The turn may be made each time to the right, or alternately, turning to the right when the Polka starts with the left foot, and turning to the left when it starts with the right. It may also be made to the right and left at pleasure. Slide left foot to side (2d), 1; close right to left, 2; hop on right, and at the same time bring left in front (3d raised) 3; one measure. Polka-Redowa one measure. Repeat, commencing with the right foot. The turn to he made on the Polka-Redowa. The Polka Mazurka, with Weaver's music, was introduced in Aberdeen about 1856 by the late Mr A. F. Skinner, who had gone to London to acquire them. Like all dances in three-pulse rhythm, the Polka Mazurka is pretty difficult. The steps employed consist mainly of slide and hop. One often sees it danced in a way—counting three beats to the bar and suiting the action to the word—"nae that ill," but, as we used to say at school, "Near's nae it." The dance, in short, requires a master; and, when it is properly done, the effect is very marked. For the second bar, perform three steps of the Polka (minus the spring at the start), turn round with the Polka step ready to repeat with the right foot ... 1 bar. Lady commences with the right foot.